12/23/10 Estimating Acidities and Alcohols for Labels. I should really do some final analysis which could be done from bottles but, I am lazy and taste is the ultimate criteria at this ;point anyway. Still its useful to know to establish quantitative targets for future vintages before the full flavor of the wine has developed. Barrel Blend T.A. Alc. % Vol. 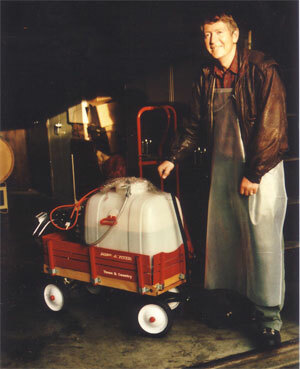 11/14/09 We were fortunate to have Marketta Formeau former winemaker at Chateau Potelle, visit on this day pressing the last of the 2009 vintage. She tasted the Carmenere from 2007 and 2008 and identified that the 2007 Carmenere is somewhat overoaked now and should definitely be bottled immediately. She also did a little blending experiment and showed us that a 15% addition of the 2007 to the 2008 would improve the 08 Carmenere significantly and make it ready for bottling which she recommended to capture the fruit that the 08 still has. We went ahead and made this swap of 15 % of the Carmenere between 07 and 08. 10/4/08 Barrel tasting at 08 crush. 1/2 barrel recoop with 66% Carm/16.6%Merlot/16.6%Cab Unanimous agreement that this is an excellent wine, best of 07. Very smooth, unique nose that is pleasant, perfect balance. Relatively low alcohol I think. 1 barrel Merlot Good sound wine, simple one dimensional. Balance good. 1 barrel 50% Cab/50% Merlot Coming along. Probably has some V.A. which the Cab had significantly in the tanks - White film. Had a bitter finish when first put into the barrel but, that is fading. It will be O.K. Wine was left on the lies quite a bit longer than usual this year. 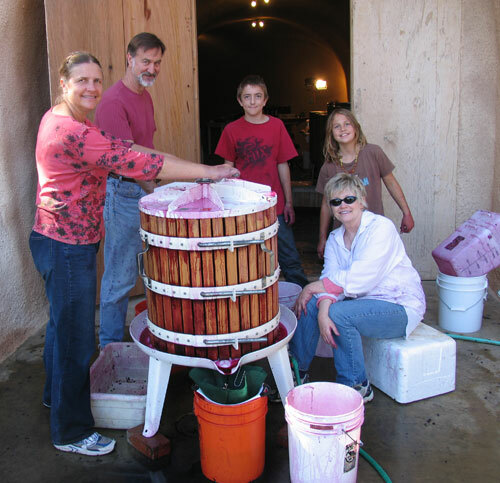 Cindy and I finally racked the wine off of the lies on 2/18/08 but back to the tanks. Flavors from the yeast hopefully will add some complexity to the wine. Sur Lies is a common technique for this purpose in white wines. Less so in the reds. My assessment is that the wines are rather bitter now especially the Merlot with its high alcohol levels. I anticipate that we will need to add some more tartaric acid to improve the acid alcohol balance. M.L. fermentation is probably also complete which reduces acidity and may have contributed to the imbalance. Mouth feel is also still out of whack due to lots of CO2 still in the wine. Post Fermentation Analysis below was performed on 11/28/07 M.H. Racking back to tanks also shown. D- Carmenere 25.6 gal. 4.5 g/l 4.34pH 14.3% F 22.9 gal. Flat low acid, added 1g/l acid after measurement. E- Cab 28.2 gal. 6.05g/l 3.61pH 13.8% B 24.5 gal. Slight green pepper in the nose. F - Cab 28.2 gal. 5.5g/l 3.84pH 13.6% E 26 gal. Learned at Wine and Grape Symposium that Temperanillo has similar low acidity to Carmenere and highly variable yield. I suspect there is a genetic link between these two varietals. M.L. innoculations were done by Cindy on 10/29/07. 10/28/07 we pressed the wine. Tim and Glista were the key participants this day. First monitoring of must via wireless sensors. See actual mass and temp data there for these fermentations. Peak fermentation temps were almost 10 degrees F cooler than in other years because of the cool temp in the cave and no attempt to heat the ambient as we usually did in the garage in Palo Alto. Peak temp was 74F instead of 85F in previous years. This was done somewhat on purpose to back off on total tannins extracted into the wine. 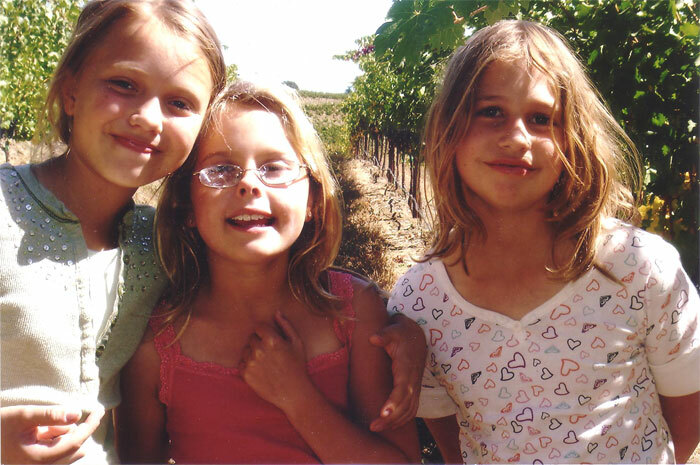 The idea being to make the wine more approachable at an early age. 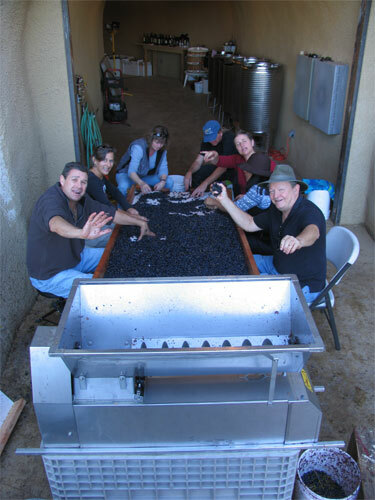 The Harvest Gang crushing the Cab and Carmenere. Alan Broad was our champion sole helper when we crushed the bin and 3/4 of Merlot. 9/16/07 We harvested the Merlot with a Brix of 27.8 and crushed in front of the main portal of the new cave for the first time. vol. pre dil. T.A. vol. post dil. B-Mer. 42 gal. 27Brix 1116 S.G. 3.53 pH 4.95-5.2g/L 66F 7.8% dilution 45.3 gal. A-Mer. 42 gal. 27.6 Brix 1119 S.G. 3.57pH 68F 9.4% dilution 45.9 gal. C-Mer. 42 gal. 27.6 Brix 1120 S.G. 3.60pH 67F 5.2% dilution 44.2 gal. D-Carm. 32.7 gal. 26 Brix 1110 S.G. 4.03pH 4.6g/l 62F 3.5% dilution 33.8 gal. E-Cab 39.3 gal. 26 Brix 1111 S.G. 3.62pH 6.0g/l 64F 9.8% dilution 43.2 gal. F-Cab 39.3 gal. 26.5 Brix 1115 S.G. NA NA 64F 11.3% dilution 43.7 gal. 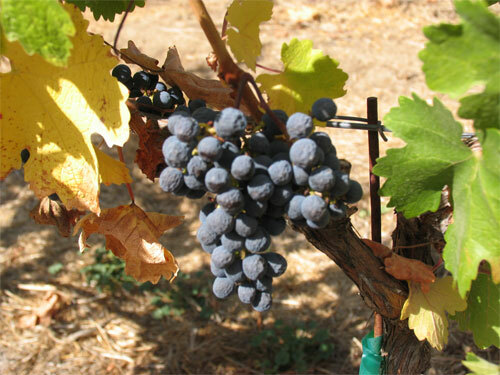 The Carmenere yield was very low due to a poor fruit set probably due to lack of molybdenum spray this year on time. Nitrogen Data from Gusmer taken on bunches pre harvest, date?